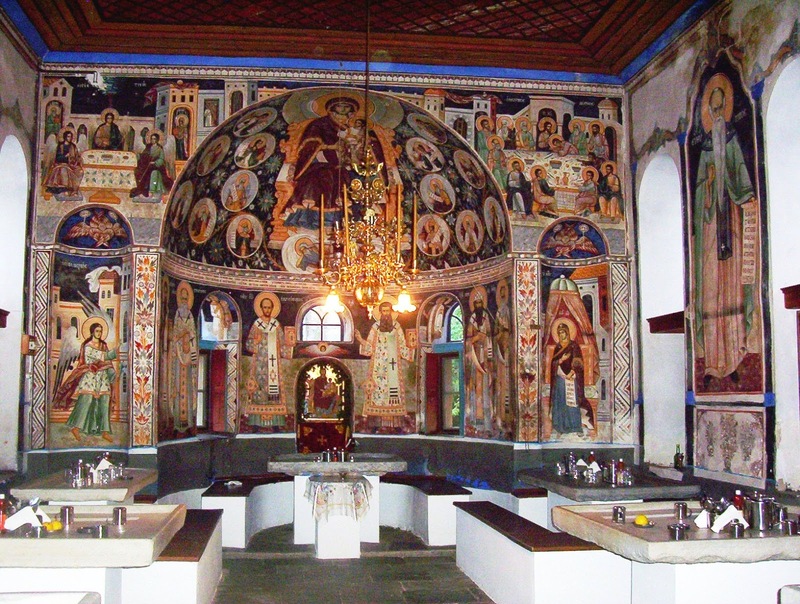 Monastery of Vatopedi. The dining room. ” The feast of the Annunciation on March 25 was bound to occur sometime during the Lenten fast, sometimes even during Holy Week, leading many of our authors to make special dietary provisions for it. Without discussion of possible complications, Stoudios enjoins the celebration of the feast of the Annunciation with fish prepared with olive oil and accompanied by three measures of wine. In the tenth century, Latros does likewise, prescribing fish and the use of olive oil “with moderation.” Black Mountain also considers this feast a legitimate reason to break a fast with two meals, including any available fish, prepared with oil and accompanied by wine. Kosmosoteira , faithfully follows these provisions of its Evergetian model. Phoberos mostly does so also, but restricts the consumption of leftovers from the feast on fast days and omits Easter Eve from the list of days in Holy Week when it must be celebrated. Kecharitomene permits a celebration with shellfish during Holy Week only on Monday, Tuesday, or Thursday (i.e., the non-fast days). Should the feast occur on Wednesday or on Good Friday, the nuns were to be content with cooked legumes and vegetables accompanied by olive oil. The Easter Eve fast was not to be broken. Mamas , followed by Heliou Bomon, makes similar provision for occurrences during Holy Week, but permits wine of the greater measure as a consolation on those days when cooked legumes had to be served for the feast in lieu of shellfish. Pantokrator is not much different, permitting celebration by consumption of fish at any time in Lent, including on Holy Thursday, except during the weekdays of the first week of Lent and the other days of Holy Week. If the feast occurred during a day during Holy Week when fish could not be consumed, the monks were to have the consolation of the use of wine and olive oil. Byzantine Monastic Foundation Documents: A Complete Translation of the Surviving Founders’ Typika and Testaments edited by John Thomas and Angela Constantinides Hero with the assistance of Giles Constable Published by Dumbarton Oaks Research Library and Collection Washington, D.C.
Greek Christmas breads and New Year pies have often impressive decorations such as serpentine figures made of dough. The serpent is a survival of the doctrine for the oikouros ofis*, the ancient home-protecting serpent, which believed to be an incarnation of Erechtheus. Of course, not only Erechtheus was depicted as a snake but also Ζeus Ktesios (the Acquirer), the protector of the storehouse, was represented as such. The Minoan snake-goddess was a house goddess too. The cult of the house snake still survives in parts of Greece. Among farmers, we find the snake as a spirit of the earth, a spirit who possesses life-giving powers and ensues health and good fortune. 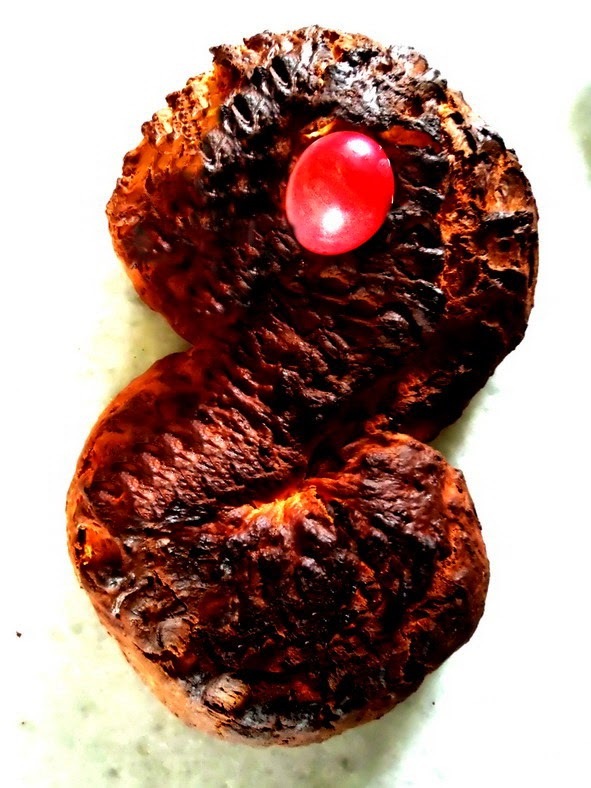 So, don’t forget to decorate your New Year pie with a dough- snake. May it bring you health, happiness and prosperity. Oikouros: the word is a compound of oikos= house and ouros = a watcher. Byzantine dreams and white bread. ….Getting or eating or merely seeing a loaf of white bread signifies harshness and strife for any dreamer. ….If someone dreams of eating white bread he will get profit sufficient for life’s sustenance. But if the bread is hot, he will fall ill.
Dreambooks are one of the oldest forms of practical literature. Of course, same dreams may not get the same interpretation in different books. 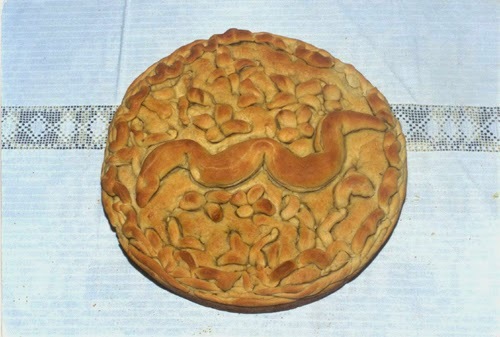 Beside its meaning in the dreams, white bread was considered the best in quality among the Byzantines. Highly milled white bread is less nutritious than wholemeal bread, but this was not understood either in Byzantium or in antiquity. Actually it was not understood until few decades ago. Throughout history white bread has been preferred to wholemeal bread because there are clear links between it and social prestige. The best-quality white bread was consumed by well -fed wealthy people and affluent bakers. *Dalby, Andrew, Flavours of Byzantium, 2003. A large number of the refugees from the 1922 Greek – Turkish population exchange were Karamanlides, Cappadocian Greeks who only spoke the Turkish language but wrote it in Greek characters. 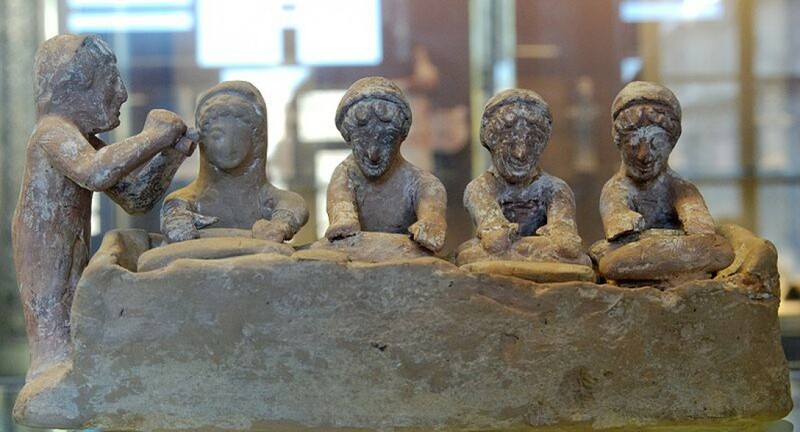 They left what had be their home for thousands of years and were relocated into the Northern Greece. The resettlement was very hard for them as they had different traditions and they didn’t understand the Greek language. Most of refugees saw a huge drop in their standard of living. However, Karamanlides brought with them the art of pastirma, hence a serious income for some families came from its production and sale. 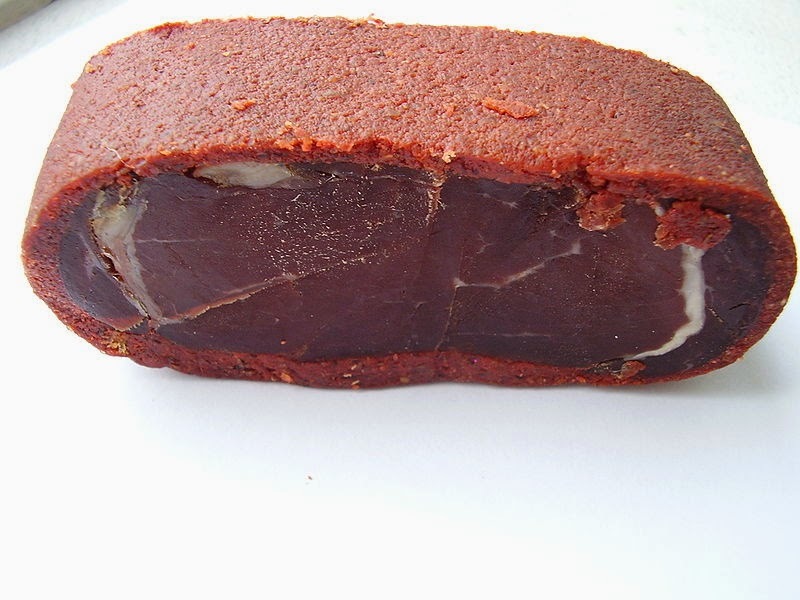 Pastirma or basturma (Gr. 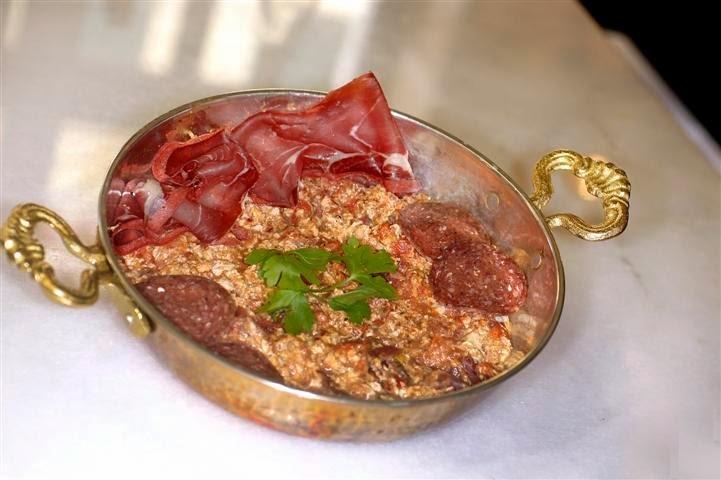 pastourmas), the wind-dried meat has been made in Anatolia for hundreds of years. Apoktin, the Byzantine air -dried salted meat, was one of its forerunners. Apoktin could come from various meats, including pig, goat, wild goat, sheep, billy goat, even fish or cuttlefish but pastourmas comes mainly from beef or camel meat. In a culture that rarely eats beef pastirma is an exception. The layer of tsemeni is an innovation of the past 150 years, however the simply salted pastourma (without tsemeni) is still found, under the name Roumeli pastirmasi. Recently, Phanis Theodoropoulos, owner of the famous pastourma and soutzouki charcuterie ‘Arapian‘ and Paraskevas Sarimpoyias, a descendant of a Karamanli family and owner of ‘Sary‘ company (a fourth generation workshop for the production of cold cuts based in Drama) joined forces to open ‘Karamanlidika of Phanis‘, a charcuterie & fromagerie with a smattering of tables. Here you can find a great selection of aged cheese, cold-cuts, gourmet products and a small menu of some of the most characteristic Karamanlidika dishes. The menu is based on suggestions made by Paraskevas Sarimpoyias and Stella Spanou, a chef, cookbook author and photographer from Thrace. Small menu, great taste! Symbols for warding off the evil influences and christian symbols play an important part in the Greek festive breads. In parts of Greece, the early Christian tradition of number 8, symbol of Jesus resurrection,* survived in the Easter breads. However, today, its meaning has been almost forgotten. Dissolve yeast in the water and add about 1/2 cup flour. Mix thoroughly, cover with a cloth and set in a warm place to rise for 2 hours. Add the ingredients in the order they are listed. On a floured surface knead the dough for 2-3 minutes and let rest for 2 hours. Knead again for 2-3 minutes until elastic and smooth. Form 4 ropes and twist in the shape of 8. Place the breads on greased baking sheets and allow to double in size. Brush with beaten egg. Place the dyed eggs. Bake breads in preheated oven (175 C) for about 40 minutes or until golden brown. *Jesus war raised on the day after the Sabbath, which is the 8th day. Both of them are written by Evy Johanne Harland. and pharmaka (drugs) and enchanting charms for passion (φίλτρα θελκτήρια έρωτος). And spells to heighten the drama of eros, spells to dissolve the unhappy love and cure the pain. Take wax [or clay] from a potter’s wheel and make two figures, a male and a female. Make the male in the form of Ares fully armed, holding a sword in his left hand and threatening to plunge it into the right side of her neck. And make her with arms behind her back and down on her knees. And you are to fasten the magical material on her head or neck. Write on the figure of the woman being attracted as follows: On the head: VM; on the right ear: VM; on the left ear: VM; on the face: VM; on the right eye: VM; on the other; VM; on the right shoulder: VM; on the right arm: VM; on the other: VM; on the hands: VM; on the breast: the name, on her mother’s side. Of the woman being attracted; on the heart: VM; and below the lower belly: VM; on the pudenda: VM; on the buttocks: VM; on the sole of the right foot: VM; on the other: VM. And take thirteen copper needles and stick one in the brain while saying “I am piercing your brain, NN”; and stick two in the ears and two in the eyes and one in the mouth and two in the midriff and one in the hands and two in the pudenda and two in the soles, saying each time, “I am piercing such and such a member of her, NN, so that she may remember no one but me, NN, alone.” PGM 4.296-466). *Eros in the context of ancient Greek culture was not flowers and happiness. It involved annoyance and pain on the body and soul. 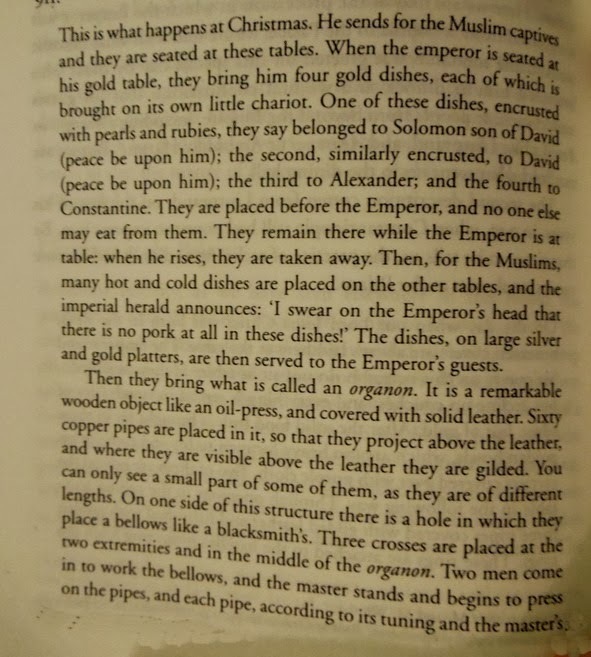 Harun left us a description of a Christmas banquet with the Byzantine emperor. Harun didn’t described the food. Such description was apparently viewed as inappropriate. Deer, beef, hare, male goat, wild boar, wild goats, gazelle and all game birds; lean meat, double cooked, hot and spicy, and suckling animals. Eat any fish except the wet ones; do not eat rainbow wrasse and gugdeon. Use pungent flavours, such as pepper, leeks and mallow. Avoid broad beans, lentil and lupins. Among fruits don’t eat dates and bay berries; eat the rest of fruits. Drink old and flavorful wine. Now, you can imagine what the emperor might have eaten…. 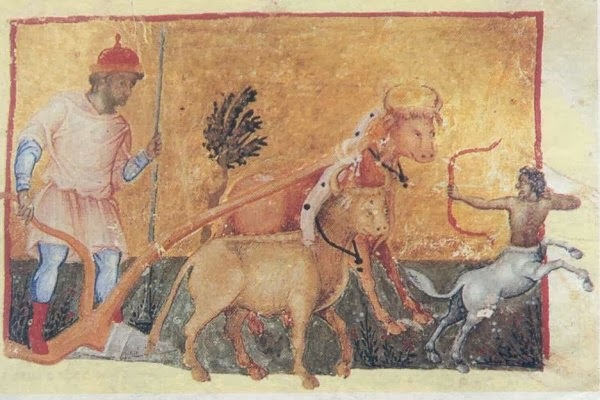 *Liliand Simeonova, In the depths of tenth-century byzantine ceremonial: the treatment of Arab prisoners of war at imperial banquets, BMGS 22 (1998), 75-104. Grandma, may I have a kourabiedaki? (kourabiedaki is the diminutive of kourabies) This was my pre Christmas refrain as a child. A kourabiedaki, as if the diminutive word could make the kourabies look smaller and the result of eating it during a fasting period would be less important. Because the days before Christmas Day are not only about honey syrup, butter and sugar clouds. They are about expectations and children’s impatience as well. This delicious cookie, also known as kurabiye (Turkey) ghraibeh or ghraybeh (Middle East), might be the descendant of the medieval nuhud al-‘adhra (virgin’s breasts). Four 13th-century cookbooks from the eastern Arab world reflect a fascination with this buttery delight. A kurabiye recipe listed in the Ottoman Cookery, a collection of classic recipes of the Ottoman Empire compiled byTurabi Efendi (1864), calls for 4 parts flour, 2 1/2 parts sugar and 2 1/2 parts butter (p.128) Another one calls for 2 parts flour, 1 3/8 butter, 1 part sugar and 1 nutmeg (grated). 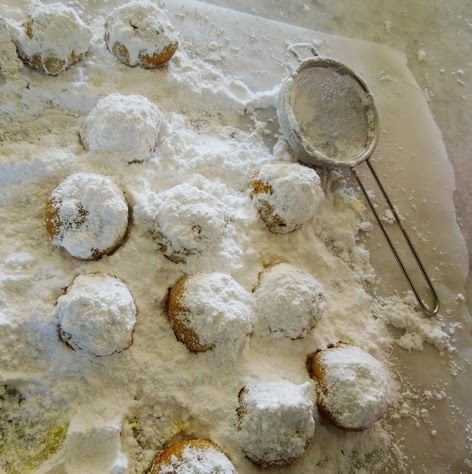 Although the typical ingredients of Greek kourabies are also flour, butter and sugar I am very fond of the local variations favored in the Greek islands and Peloponnesos. Toasted almonds and orange blossom water give an explosive aroma to those kourabiedes. Preheat oven to medium (180c). Beat the butter with olive oil by hand for 10 minutes. Cream the butter-olive oil and sugar in a bowl. You must have a very creamy and light mixture. Add the beaten eggs, stirring constantly. Alternately add the baking soda, dissolved in the brandy and 2 tbs orange blossom water to the mixture, beating after each addition until combined. Stir in almonds and add flour as necessary to make a soft and sticky dough. Mold into half moon, small ball or star shape and place kourabiedes on a cookie sheet. Bake for 17 – 20 minutes until light golden and cracks appear at the top. Remove from oven and immediately sprinkle with blossom water. After 5 minutes roll in the powdered sugar. When thoroughly cooled, sprinkle them with some more powdered sugar. Kourabiedes with olive oil instead of butter are popular in the olive growing regions. Use the above recipe but substitute the butter for olive oil and add 200 gr. almonds instead of 50 gr. Religious rituals and symbolic practices in which food is used to secure the future harvest are still important in Greece. Their parallels are found in very ancient times, when fertility and food security were matters of life or death. Τhe 21th of November is dedicated to the Presentation of Virgin Mary to the Temple. This feast is also known as Panagia Mesosporitissa (Panagia= Virgin Mary, mesos= middle, sporos= seed), Panagia Archisporitissa (archisporitissa = the sowing begins) Panagia Aposporitissa (= the sowing is over) or Polysporitissa (many seeds) because of the offering of legumes and grains of the latest harvest. They are boiled together and brought to the church in order to be blessed by the priest. Then they are eaten by those attending the liturgy, under wishes for a rich crop. It is said that the grains grow faster if they are sown until the 21th of November, thus, there is a rain litany during the festival, if the rains has not started. 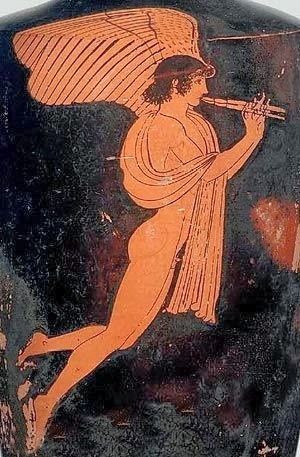 Please click here to read about the rituals of magical rain- making in modern and ancient Greece. Pay special attention to the ”Celebration of the Presentation of the Panagia (the Virgin Mary) on 21 November in relation to the ancient festivals of Demeter”, p. 205-208. And click here for more feasts connected with polysporia. 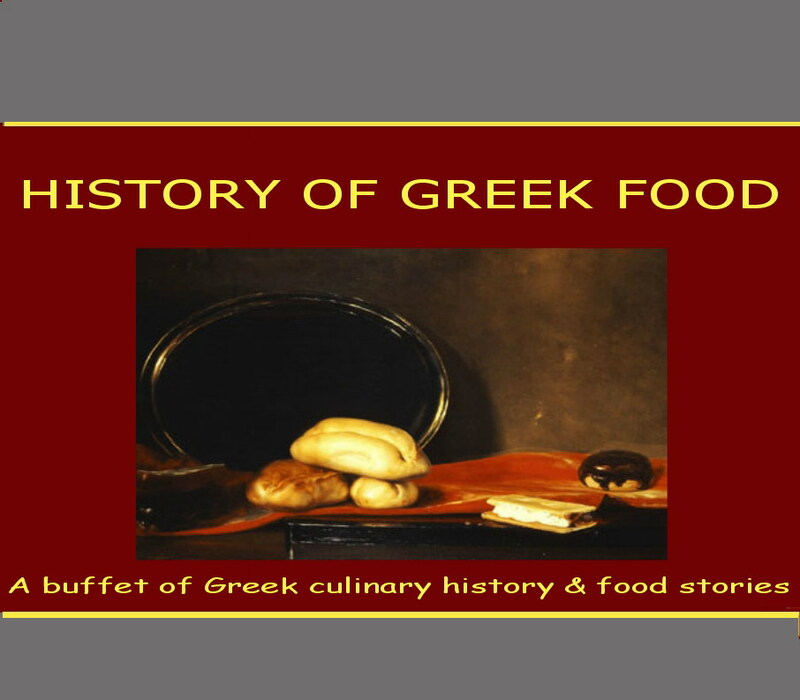 (c) 2007 - 2015 www.historyofgreekfood.wordpress.com and Mariana Kavroulaki-. All rights reserved.